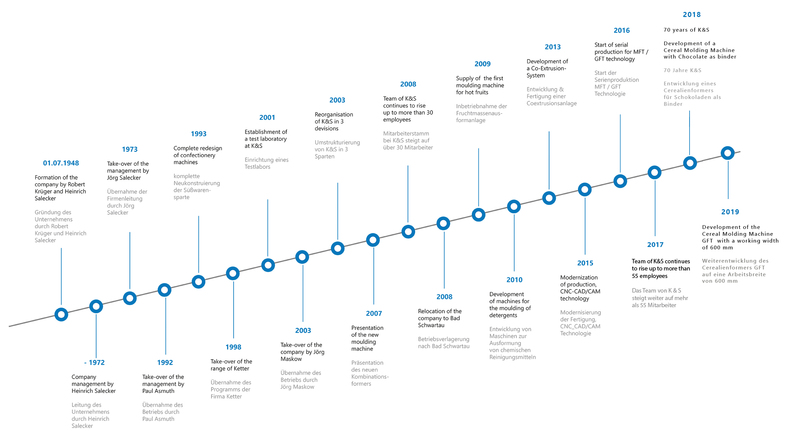 The company´s history since 1948. On July 1, 1948, 10 days after the currency reform, the company Krüger & Salecker was founded by Robert Krüger and Heinrich Salecker under very hard conditions. The history of Krüger & Salecker begins in a cellar workshop in the Schwartauer Allee in the Hansestadt Lübeck. The first rent was paid by the two founders with the head money of the new DM. The only machine in her possession was a hand lever milling machine and a lathe bed without support and tailstock. After a long search for Lübeck's scrap heaps various parts were found to make this lathe complete. This was only possible, however, since Mr. Krüger was a great master of improvisation. Since in this time the need for kitchen appliances was very great, the first production consisted of pots and pans. The pre-embossed materials were purchased from a company which had been shut down and completed in operation. The merit of this production was the capital of the company. After a while they produced various machines and equipment for the sugar industry. 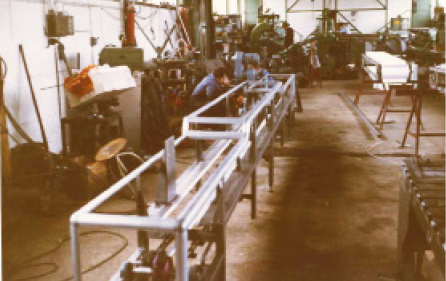 The first production was casting molds for the production of flute solders. Marzipan molding machines for the production of marzipan, marzipan, etc. have been designed and built. This was followed by the construction and construction of an unwinding machine for the production of marzipan potatoes and eggs, which is still being produced in an improved form and sold in Germany and beyond Germany's borders. In 1953 the space in the Schwartauer Allee (Lübeck) were too small, so they moved to Sadowastraße (Lübeck). As the production area was expanded and the machine park had to be enlarged, these rooms were too small. In 1965, a production hall and an office building were built on the Nils-Bohr-Ring (Lübeck). On the basis of this expansion, they were able to expand their program to the production of machines and equipment for the meat and vegetable preserves industry. Gear milling machines were produced for the manufacture of gear wheels, worm wheels and chain wheels. In 1968, Robert Krüger died suddenly from his full productions. The company was now managed by Heinrich Salecker alone. In 1973 Heinrich Salecker's son, Jörg Salecker, took over the management of Krüger & Salecker. 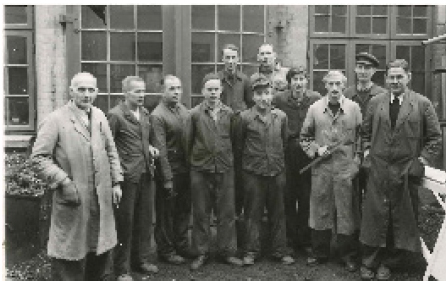 After the takeover of the company by Paul Asmuth in 1992, the program of the hydraulic presses for friction linings (disc brake pads) was extended to the program of the sweetwares party and further developed and expanded in the following years. In 1998 the machine program of the Lübeck company Ketter was taken over and integrated into the segment of confectionery machines. In 2001, a company-owned test laboratory was set up. Jörg Maskow takes over Krüger & Salecker in 2003 and restructured the company in 3 divisions (1st molding machines, 2nd friction lining machines for automation, 3rd special machines). From now on the global distribution of machines and equipment will be intensified and the employees will be equipped with appropriate language skills. Up to 14 international trade fairs / year by Krüger & Salecker have been contested to this day, which has also contributed very successfully to the formation of "Brands - K & S". In addition, the design of the machines and systems was already converted to a modular concept at an early stage from 2003, so that this innovative machine design can be easily followed by the special customer requirements, and this can be taken from the K & S standard! An ERP system was then deployed for the first time in 2007 in order to provide K & S with the necessary structures to enable all employees to have a clear overview of the ever-increasing projects. The development of new market segments with the existing modular systems will be the focus of the sales activities starting in 2007 and can be successfully implemented. Today, the K & S molding machines find their professional use in various markets and their requirements, such as, for example, milk, animal feed, meat; chemical-; pharmaceutical industry! Since the end of 2008 will require more space, the company Krüger & Salecker will move to the new business area "Langenfelde Nord" in Bad Schwartau. The company building was designed by K & S itself and has been built on an area of ​​10,000m² with extension options. K & S currently has the most modern CNC production lines, which can be controlled via the CAD / CAM connection, thus the market leadership of K & S can be further and consistently expanded further. The production depth can be as high as 98%, which ensures a quick production of spare parts for our customers and can be regarded as synonymous with customer orientation. In the year of 2018 Krueger & Salecker celebrated the 70th anniversary with customers, sales representants and employees. In the same year, GFT-cereal moulding machine was further developed into a machine that can also process chocolate as a binder. The growth of K & S can be rated with > 10% / year as very pleasing. K & S is also very happy to take on responsibility so that we can give young people the opportunity to pursue a sound education with us in 6 different professional backgrounds, thus K & S is perfectly adapted to the requirements and challenges of tomorrow. In addition, the working width has been extended to 600mm.